Lobsters have a sweet, white flesh which is usually eaten simply boiled, steamed or grilled. The females have a bright orange coloured roe which can be used to colour sauces. 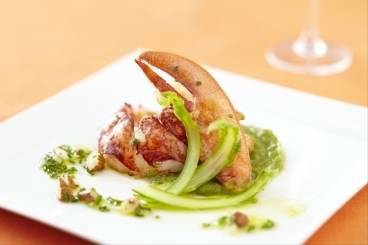 Griddled lobster served with asparagus puree, marinated asparagus, sauce vierge and fresh chervil. Sushi 'fingers' made with perfectly seasoned sushi rice and succulent lobster meat. A delicous and healthy lunch dish. Prawn bisque, chilli and chive oil.